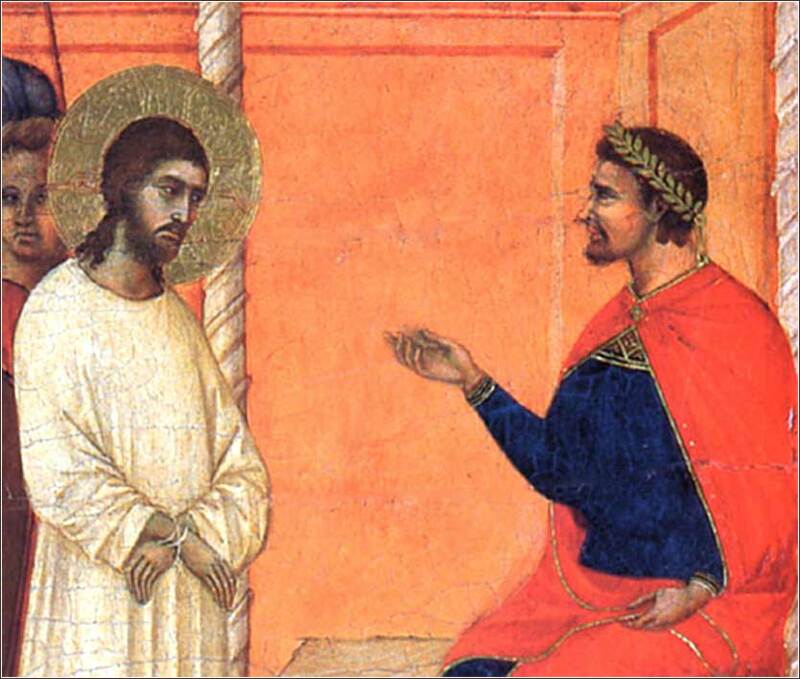 Christ Before Pilate (detail) by Duccio, ca. 1311. Saturday is Oldies Day, and we look back today to a more sentimental time, with the great George Younce singing Child of the King. 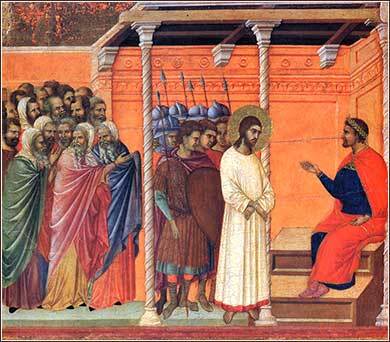 Christ Before Pilate by Duccio, ca. 1311. The full work, from which the detail at the top of the page is taken. When morning came, all the chief priests and the elders of the people took counsel against Jesus to put him to death. And they bound him and led him away and delivered him over to Pilate the governor. . . .
Pontius Pilate is one of the most interesting people in the Bible, for we rarely see a Biblical character drawn in shades of grey. Christianity is a very black-and-white, dichotomous religion; we are saved, or we are not. We go to heaven or we go to hell. In Christian terms, Pilate is a lost soul. When Christ ultimately separates the sheep from the goats (his terminology - see Matthew 25:32), Pilate will be among the goats. But in human terms, Pilate shows a lot more integrity than one would expect. He really does not want to crucify Jesus, and as we will see, tries several times to prevent it. What he does not do, however, is simply say “no”, which was within his power. He ultimately gives in to the Sanhedrin as a matter of political expediency; he would rather see an innocent man crucified than have a riot or stir up enmity in the Sanhedrin, for his Roman masters expect him to keep the peace in Judea. Even so, Pilate's extreme reluctance is interesting. Herod, and most Romans, would have simply crucified Jesus without a second thought. Jesus, in Aramaic idiom, actually admits that he is “King of the Jews”. We have seen this idiom, “you have said so”, twice in Matthew 26, once to Judas and once to Caiphas. It is unclear whether Pilate understands this to be an affirmative answer, but either way, he correctly grasps that Jesus is not a Zealot or a political revolutionary. The very fact that Jesus is being prosecuted by Sadducees and Pharisees implies that he is not an enemy of Rome. Then Jesus stays silent in the face of all the testimony against him. Pilate is “amazed”. Does this man not care if he dies? How can a man possibly be so self-possessed as to simply say nothing? If he was willing to die for some cause, one would expect him at least to make a speech. Pilate senses something special about Jesus; this ragged carpenter from Nazareth is, unbelievably, noble in the face of death (something a Roman would admire). Unfortunately, he cannot take the saving step of hearing Christ's message in his heart (unlike some Romans to come, such as Cornelius in Acts 10).